As Mad Men winds down, we find our beloved anti-hero, Don Draper, losing his agency. Over ten years in television time we’ve watched him pull rabbit after rabbit out of his fedora to stay ahead of mergers and takeovers. (Not to mention contracts.) Despite a last-ditch effort, this time there are no more rabbits. 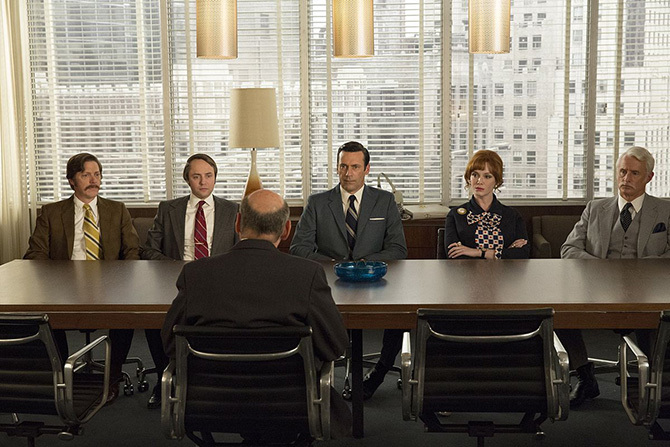 It appears Sterling Cooper & Partners will be assimilated by mega-agency McCann Erickson. Why the SC&P partners would be dismayed at joining the fold does not compute to the McCann rep. He says to them: “You’re dying…and going to advertising heaven.” Where heaven is the biggest clients at the biggest agency. And it’s true, this is heaven for many folks. But from Sterling Cooper’s point of view this means giving up their clients. The ones that stood with them while they built the agency. The ones they’ve built strong relationships with. That hits home for me. Their story is a little different than mine. In addition to clients, SC&P also faces a loss of autonomy, probably most of their staff, and the Sterling Cooper name. More than their name — their identity. If anything, I’ve been reaching beyond my old identity and giving away some of my independence! Where our stories intersect is valuing relationships over billings and not believing bigger is necessarily better. There was a time in my career when I dreaded cocktail party questions about my work: “Who do you work with?” “Have you done anything I’ve seen?” Few people had heard of my clients, and this felt like the mark of being less-than. Just as the McCann guy assumes, I did expect to move on to bigger clients and bigger agencies. Even though I liked the values-driven, emerging businesses that gave me my start, it seemed inevitable to leave them. I hadn’t yet grown into the wisdom that these clients were not stepping stones, they were my destination. Big or small, the size of the organization is irrelevant. What matters is finding people you trust and look forward to working with, towards a goal you can get behind. It’s especially sweet when they are small, though. The feeling you get from helping a founder bring her vision and legacy to life is incomparable. Now I see those questions differently. Sure, we could talk about a company you’ve known for decades, or I could introduce you to one that’s breaking new ground or making the world a better place. Which conversation would you rather have?